Just say no to carb-free nonsense! 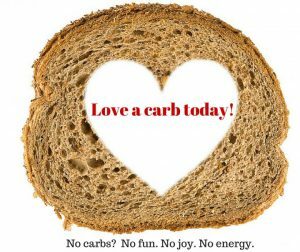 Every day as a dietitian I see some sort of online images or fad diet suggestion that vilifies carbohydrates and suggests you deprive yourself of enjoyable foods. For the record carbohydrates are an essential nutrient. Your brain needs carbohydrates for energy, mood enhancement and satisfaction. Your muscles need carbs for fuel similar to a car requiring gasoline to operate. Rather than eliminating any food unnecessarily from your diet, instead work with a Registered Dietitian that can help you understand the science of food and the right portion sizes of carbohydrate foods you need and can enjoy each day.